Enjoy Monday’s mild temperature in the upper 50s because highs on Tuesday will be between 15 and 20 degrees colder. The National Weather Service says “tonight features a strong cold front moving across from NW to SE with high pressure gradually building in from the west thereafter. The average high temperature for this date ranges between 44 degrees in inland Connecticut to 47 along the shoreline. 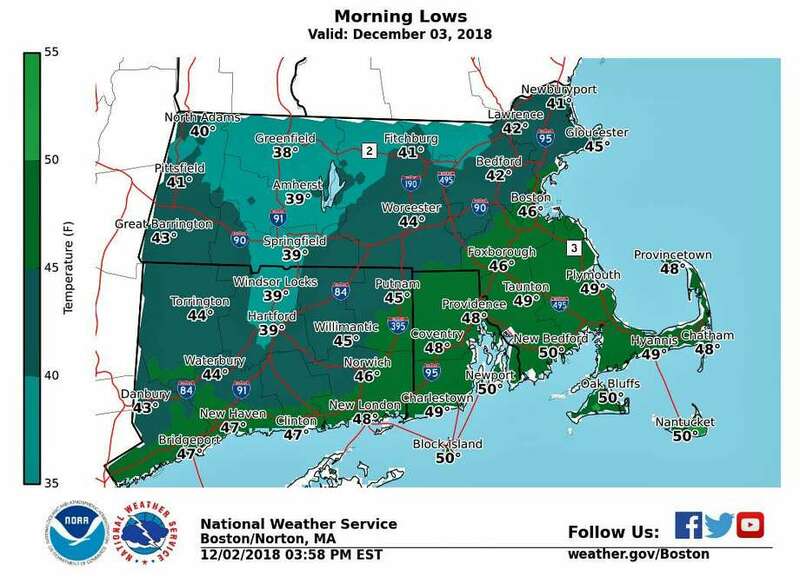 In December 2017, the last time the temperature was in the upper 50s was on Dec. 6. After that, the average daily tempertaure continued to decline. Beginning Dec. 26, 2017. the region when into a weekend-long deep freeze with temperature average 19.1 below normal on New Year’s Eve in interior Connecticut. Will Tuesday’s temperature drop will not be was extreme, the NWS says the wind chill will make it feel like the low 20s by Wednesday morning. Monday: Areas of dense fog before 9 a.m. Otherwise, mostly sunny, with a high near 56. West wind 6 to 11 mph. Monday Night: Partly cloudy, with a low around 34. Northwest wind around 9 mph. Tuesday: Sunny, with a high near 38. Wind chill values between 25 and 30. Northwest wind 9 to 11 mph. Tuesday Night: Clear, with a low around 22. North wind 3 to 8 mph. Thursday: Mostly sunny, with a high near 40. Thursday Night: Mostly cloudy, with a low around 28. Friday: Mostly sunny, with a high near 38. Saturday Night: Partly cloudy, with a low around 23. Sunday: Mostly sunny, with a high near 37.